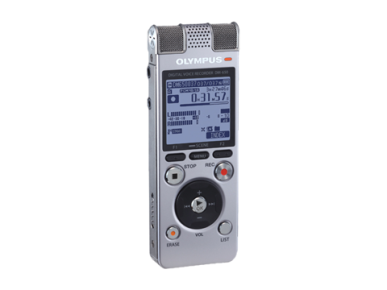 Dictaphones such as the Olympus DM-650 are the most common form of recording device. They use an inbuilt microphone for one-to-one or small group discussions. An external microphone (such as the Olympus ME34) can be used to record at a distance, such as in a lecture theatre. For best results we recommend using Audio Notetaker software in conjunction with a dictaphone.